This 6 mile circular walk combines a section of the the Green Chain walk with a look at buildings of interest in Eltham and Mottingham. 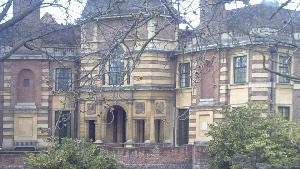 There is the opportunity to visit Eltham Palace managed by English Heritage [website] Sun - Wed. Instructions are given from Mottingham Station or New Eltham is on the route. The walk can also be accessed from Eltham Station via Well Hall Road. This was built in 1866 and the original weatherboarded building remains on the north side. There is the option of exploring the Tarn (bird sanctuary) to the north of the railway. This park includes an ice well. Then go along Crossmead south of the railway (Green Chain route) and continue through Fairy Hill Recreation Ground. Exit along Broad Lawn then go left at Green Lane. Victoria Cottages at 84-136 were built in 1897. This was a garden suburb development of 1914. The Beehive pub of 1897 has attractive features. NEW ELTHAM STATION opened in 1878 as Pope Street. Re-join the Green Chain by going left along Avery Hill Road then left along Sparrows Lane. This becomes a footpath through Avery Hill Park. There are views of the dome of the Winter Garden to the right. This passes a Tudor conduit head which supplied Eltham Palace. At the end of the path is Holy Trinity Church. The original ragstone church was designed by G E Street in 1868 but has had additions and alterations. It includes a Gallipoli Memorial Chapel. Go left at Southend Crescent and right at Footscray Road continuing to the High Street (the Green Chain goes left at North Park). The corner site was occupied by the police station 1865-1939. Opposite is Christ Church Presbytery and the 19thC Eagle House. The Fire Station of 1904 which originally had horse drawn appliances lost its frontage in 1933. The corner building of 1888 was formerly the Man of Kent pub. Cross and go into Blunts Road. Numbers 3-7 of 1872 were additional Philipot Almshouses. There are modern almshouses (Fifteenpenny Fields) on the right. The Fifteenpenny Land Charity is based on a bequest of land by Henry VII in 1492. On the right are the distinctive Rising Sun pub (rebuilt 1904) and the Carnegie Library of 1906, now incorporated into the Eltham Centre. At the end of Roper Street on the right is the village school of 1868. The early 19thC building was a former RC school. Just beyond this go left along Carpenter's Arms Path then right along Philipot Path. Do not go into the street ahead but follow the path around to the left. 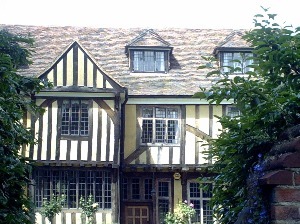 In the corner is the entrance to the current Philpot Almshouses (no public access). The original 6 houses built on the High Street in 1694 were demolished in 1929. The post office was built in 1912 and enlarged in 1935. It was converted into a pub in 1995. The paved area ahead has a village sign in depicting notable Eltham buildings and a view of the 18thC Cliefden House opposite. Cross the High Street and go along the passageway to the right of this building. There is a view of the rear of the property and also some remaining outbuildings. The buildings on the corner were Eltham & Mottingham House, opened as a cottage hospital in 1898. These houses of c1840 are separated from their 'gardens' by the path. At the High Street go to the left. The double fronted bar/restaurant (c1720) was a pharmacy in the 1860s. The Greyhound pub was rebuilt to its original c1720 appearance. Tillings Horse Bus was stabled at the rear of these premises at one time. McDonalds occupies a former Burtons shop of the 1930s which had a dance studio above it. 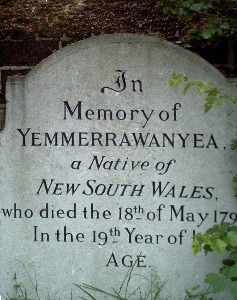 This was built on the site of the Eltham Congregational Church. Cross the junction to the church. Note: if using ELTHAM STATION you will join the route here. The Bankers Draft pub was at one time a Martins Bank. Three shops just before the former Crown pub (rebuilt 1930) date to 1810. Old walls and gateway remain on Tiltyard Approach to the left. The Tiltyard would have been used for jousting and tournaments. The Gatehouse of 1914 alongside has rose & portcullis designs. On the right are the attractive Tudor Lord Chancellor's Lodgings comprising a parlour, hall and great chamber [pix]. The bridge and Great Hall of Eltham Palace date back to 1480. The Courtauld House in Art Deco Style was designed by Seely & Paget in 1936. On reaching the Green Chain signpost go left keeping the palace grounds on the left and the field on the right. The field belongs to Middle Park Stud. There are splendid views across to London from this path. Past stables go through the barrier and continue along the track. Where the Green Chain splits continue ahead (signposted Mottingham Lane). Cross Middle Park Avenue and the railway (via the footbridge). Cross the A20 Sidcup Road towards a BT building and continue on the path alongside this. At Mottingham Lane go to the right. 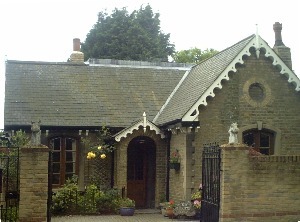 The Lodge and Woodcroft are outbuildings of a demolished 19thC house. Fairmount (c1870) has a blue plaque to cricketer W G Grace. It has been extended and is now a residential home for the elderly. Norlesden House (c1870) is built in polychrome brick and has a coach house. Cley Cottage was built as the new farmhouse in 1862 [pix]. Mottingham Farm was worked until the 1950s but is now used as riding stables. Cedar Mount has been built on the site of a late 19thC house whose Gothic coach house remains. 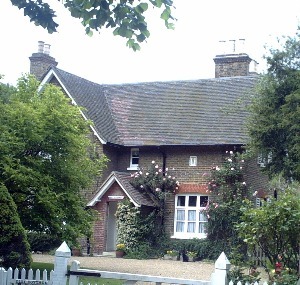 The Copse was a late 19thC cottage extended in 1911. Continue to the end of Mottingham Lane and go right at Grove Park Road. Eltham College to the right includes Fairy Hall of 1856 and a chapel of 1903. Cross the road and go along The Crossway. At the end on the right is Fairy Hall Cottage, a Court Farm building of c1750. Cross Court Farm Road into Dorset Road. Go through a passageway on the left opposite Portland Crescent then right along Devonshire Road. The houses here were built around 1870. At the end go left along Mottingham Road. The Porcupine Inn was rebuilt in 1922, the same year as the War Memorial was erected. These large houses of the 1880s have many decorative features. Cross Sidcup Road and go to the right. A path on the left leads back to Mottingham Station.